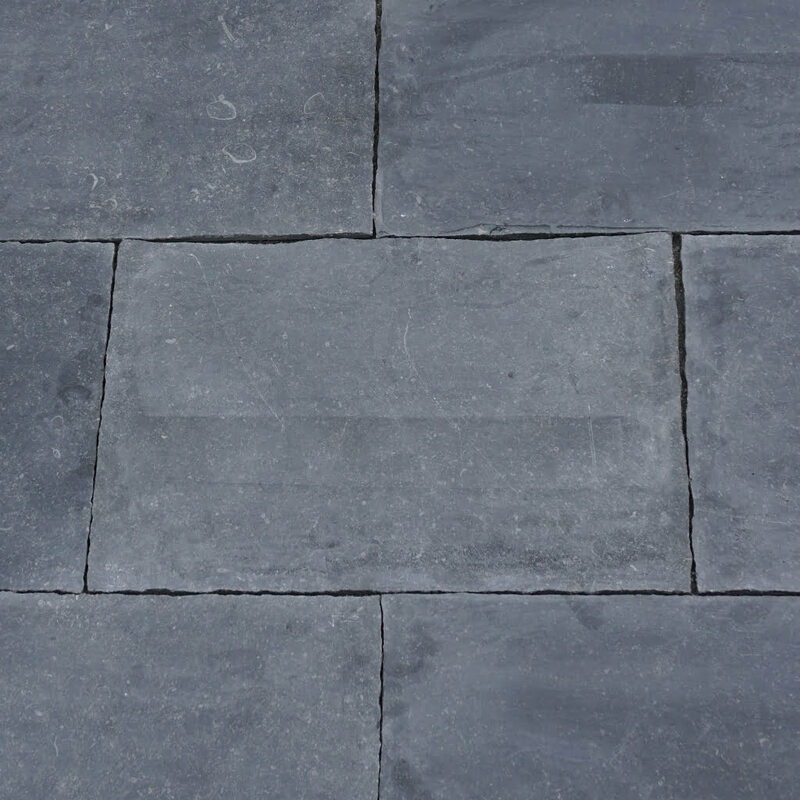 The Belgian bluestone flooring is renowned for creating a minimalist, dark but also warm floors in exclusive homes. It is also beautifully used in combination with the limestone and the antique French oak flooring. Our bluestone floors, surfaces and slabs from Belgium will not wear, and is known to have one of the hardest surfaces. Is often installed in commercial high traffic areas due to its’ durability. The antique Belgian bluestone floorings are worldwide famous, carefully salvaged surface are carefully dismantled by hand from exterior Chateaux, antique homes, Manor houses, churches. A soft dimpled and pitted surface, and other signs of heavy exposure, will show after 150 plus years of use. These reclaimed stone floor tiles are characteristic of centuries of history, time-worn surfaces with gentle scars and smooth surfaces that create an authentic, unmatchable appearance in stunning antique floors that exhibit a full spectrum of warm shades of color and tone. Reclaimed stone floorings add a deep sense of age and grace to any property. Available upon request. Authentic Provence offers a selection of vintage antiqued Belgium bluestone floorings. Heavily worn square stone, random format stone and square, lightly worn stone slabs. All our bluestone is cut to a thickness of 0.6” for easier installation. This distressed Belgian bluestone flooring replicates the authentic imperfections of an antique stone floor. The aging of this antiqued bluestone flooring is fully done by hand. This bluestone flooring is favorable in bands of 23” with free lengths but also available in different dimension up to 39” . These surfaces can be sealed either with a French floor wax or a penetrating wet or dry look commercial grade stone sealer. These characteristics are the result of long geological evolution, which gives a prestigious touch to any property. Our floorings can even stand frost and rainy climates for outside paving. For outside use we advise a minimum thickness of circa 1”. For interior use the natural stone floorings normally measures 2cm (0.8″). Belgian stones also adapts perfectly to the demands of modern comfort such as the use of floor heating.